Thayer tagged me with the 8 random things meme…again – she’s forgiven as we barely knew each other in August last year. I couldn’t manage eight last time (this was the last one) so some of these might not actually be entirely true. 1. I once spent three months measuring the hedgerows of Gloucestershire. You can still find some of my waymarkers on country lanes just outside Cheltenham, if you know where to look. 2. My favourite colour combination is the kind of orangey-brown of krispy-kreme donuts against catkin green. 4. I was once almost arrested for possession of a Mr Kipling Bakewell Tart (and a milkbottle). This was during my New Romantic phase, so the frilly shirt and heavy eye make-up might also have had something to do with it. 5. I had a walk-on part in the film “Stab Truck” (I was the synth player in the band during the flashback to the David Hasselhof character’s complete humiliation in a London night club.) 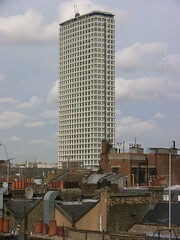 It was filmed in the basement of the Centrepoint Tower. 6. One of my cousins was the artist’s model for Freddo the Frog, Cadbury’s 1970’s novelty moulded chocolate. He went on to design the wheel nuts of the Audi A8. 7. My gerbils’ names are Rainey, Bessie and Janis after the 3 greatest female blues singers of the 20th Century. People often imagine that if they see the white one, that must be Janis, but my gerbils (and the blues) are colour-blind. 8. As a student I worked in a launderette in Guildford. I have seen, touched and washed the underwear of Eric Clapton, Bonnie Langford, Michael Buerk and various forgettable members of the Prog Rock Hall of Fame. So to pass it on, I tag: HM The Queen, Ronnie Hazlehurst, Lewis Carroll, Mickey Dolenz, Pogle out of Pogle’s Wood, Optimus Prime, Stuart Hall (not the Jamaican one, the one off It’s a Knockout) and the entire Electric Light Orchestra. Ah. . .you’re trying to pull a fast one mate. Madness is as madness does. An entire list marred by one falsehood–measured hedgerows in Glos. You must take us for simpletons, sir. Admit your treachery and all will be forgiven! Given the eccentric nature of your personality–modern day Tiny Tim impersonations aside–the remaining 7 “facts” are entirely plausible. Lloyd… the detail about the gerbils has made my day. You are truly…um….’unique’, although by the sounds of it a tad Rainman. podchef – what can I say? It’s a fair cop – even the best of us slips up from time to time. Of course it was actually Gwent, but I didn’t want to admit to being a Welsh Hedgerow Measurer as that has some untoward connotations this side of the pond. miss jones, ‘course i’m an excellent driver – hey if you got a thing for those of us a bit further along the aspergers continuum you should check out some of the people in my flickr stream – I’ve got a guy named after a bus route.